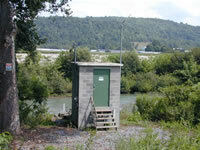 LOCATION.--Lat 41`47'49", long 77`04'50", Tioga County, Hydrologic Unit 02050104, on left bank on Township Route 754, 0.7 mi south of Mansfield, and 0.9 mi downstream from Slate Creek. PERIOD OF RECORD.--July 1976 to current year. GAGE.--Water-stage recorder, crest-stage gage, water-quality monitor, and heated tipping bucket precipitation gage. Datum of gage is 1,121.28 ft above above National Geodetic Vertical Datum of 1929. Prior to May 25, 1999, at site 0.3 mi upstream at same datum. Satellite and landline telemetry at station. Supplied by NWS: Action stage-9 ft; Flood stage-12 ft; Moderate flood stage-13 ft; Major flood stage-14 ft.